Now that it has been established that alcoholism is a genetic disease of the brain, medications are being developed to assist in treatment and recovery in drug rehab programs. Drugs, medications, medicines, herbs and supplements, and nutraceuticals are all words used to describe substances that people take; maybe to cure an illness, make themselves feel better, or to diagnose a potential problem. All of these substances have an impact on the body and may potentially interact with each other. For your own safety, you need to always tell your doctor of the drugs you are taking, even if they are illegal, so that the doctor can assess your safety. We hope you find the following websites useful for helping you understand alcoholism. Drugs and alcohol entering a child's life are probably some of the most challenging and sadly, some of the most common issues parents have to face today. Alcohol in particular is very available and often considered innocuous by kids and many adults. However, it can be as deadly as the other drugs kids will come across. It is a part of our culture and of our lifestyles. But alcohol has no place in a child's life. So, when it hits, we tend to feel powerless and guilty for what happens to our children. How can we deal with it? Getting informed, assessing your kids, and taking the right steps to prevent them from getting in trouble with alcohol, are essential things you can do as parents. If your child is already in the grips of alcohol addiction, sometimes an alcohol intervention may be necessary. Drinking and Driving is one of the deadliest forms of alcoholism: it kills fast, and it kills a lot. Mostly young people, and not necessarily those who are at fault, get hurt. Even when death is not an outcome, consequences from car crashes are devastating: disability, trauma, death, guilt, etc. Entire lives are affected.If you have been injured in a accident where alcohol has been a contributing factor make an accident claim now with UK injury claim and compensation solicitors. Fetal Alcohol Syndrome (FAS) is: a terrible disease affecting those babies whose mothers drank alcohol while they were pregnant. Malformations of the head and face, mental retardation, organ malformations, growth retardation, form the symptoms of what is called FAS. But even when the baby is not born with these symptoms, it is now proven that alcohol exposure during pregnancy causes serious problems for future development of the baby. Alcohol withdrawal is a condition relating to a variety of symptoms that stem from abruptly ceasing the consumption of alcohol. Generally, the onset of delirium tremors (DT's) from ethanol withdrawal occur 48 to 72 hours after the patient’s last drink. Alcohol depresses particular nerve cells in the central nervous system. Therefore upon alcohol withdrawal, a person’s nervous system frequently experiences a reversal, so that the excitatory processes are often enhanced. Common withdrawal symptoms include nervousness, tremors, anxiety, irritability, fatigue, depression, insomnia, tachycardia, and dilated pupils. Approximately 15% of recovering alcoholics experience withdrawal seizures. Treament is available to those who want it. Once a person realizes that they need treatment it is not hard for themselves to seek out help. 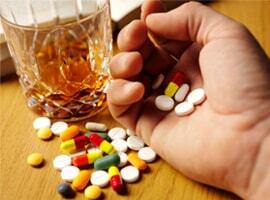 Alcohol Treament is there to provide you with the help and support that one needs. Detoxification -- medical management of alcohol withdrawal -- can be performed in either an inpatient or outpatient setting and can last up to a week. Pharmacological treatments for alcoholism that address alcohol withdrawal are benzodiazepines and naltrexone (or ReVia).